The design of today’s sophisticated recording console is quite complex, due to the multiplicity of devices associated with the mixing network, such as dynamics processing and automation. Many will recall when paralleled battery rheostats were used as mixer controls for broadcasting and motion picture sound recording, and will view the modern console as an outgrowth of the basic principles applied at the time. With miniaturization, many components are now included in the mixer network, rather than at a remote position. Printed circuit plug-in designed components facilitate replacement in the event of failure. 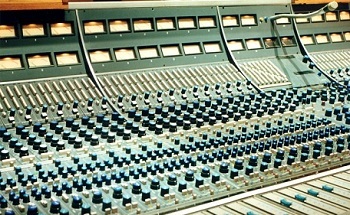 Several different types on analogue solid-state and vacuum tube mixers exist along with solid-state digital mixing desks. Foundational text inspired by Howard M. Tremaine's, "Audio Cyclopedia" and "Audio Engineering know it all". Do you have content, to add, about Recording and Film Consoles or associated topics? Please feel free to Share it, here! We went to great lengths to restore and modify these two consoles for doing 50's style recording straight to Ampex full track 350.